Land in October 2013 prior to move. Ready for worship service in March 2014. Vida Abundante relocated in November 2013 to a lot in Colonia Emiliano Zapata, the neighborhood the pastors described above at 80 Av. Bis between Calles 10-12. 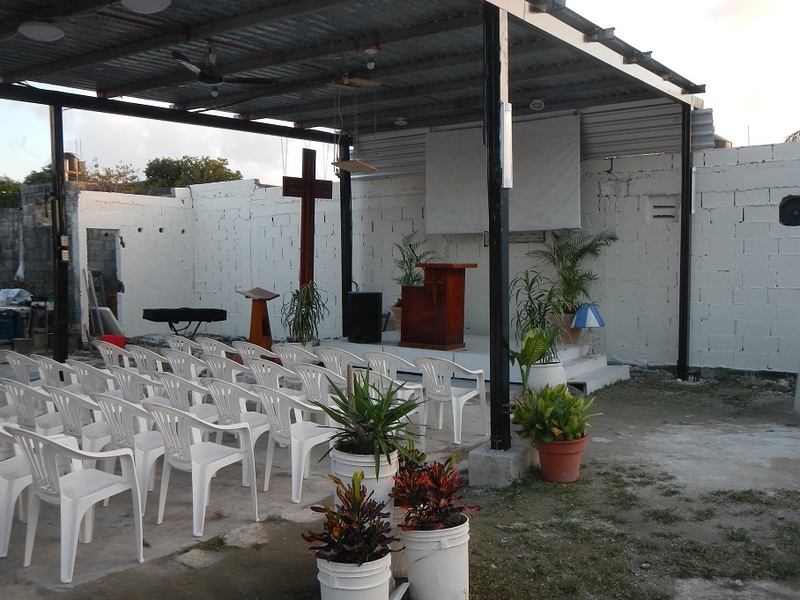 The church rented the lot with partial construction for 2,000 pesos monthly (~ $165 USD) with a purchase option. 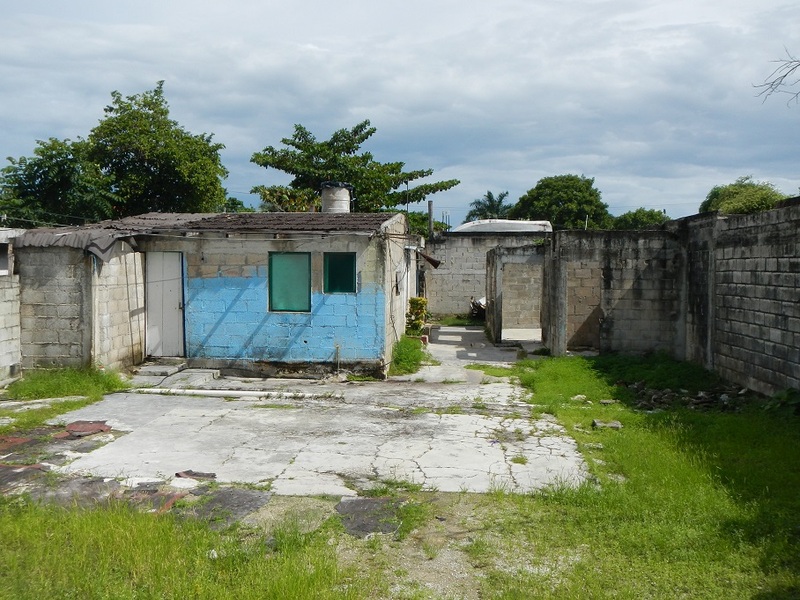 The cost of the land was set at 550,000 pesos (~ $44,000 USD) with a down payment of 30,000 pesos and 5,000 pesos (~$400 USD) monthly payments for eight and a half years. In March 2014 the church’s prayers were answered when opportunity and resources all came together in a couple of days . . . the RIGHT place (current rental location), the RIGHT time (landowner dropped the price of the land nearly 1/3 to ~$30,400 USD if paid for in a short time), the RIGHT resources (donations for the down payment and offer of free legal services) allowed the church to seize the moment. The decision was made based on faith supported by a realistic financial plan. Vida Abundante executed a purchase agreement and initial payment on March 14, 2014. The church is working hard to earn money for the monthly payments and is seeking funding to pay the balance owed to the landowner by December 2014. Click here for Financial Plan for Vida Abundante Land Purchase. Jesus instructed the men to throw out their nets and they explained that they had fished all night without success. But because he asked, they did so and their nets filled so quickly they began to break. Jesus then told the disciples to come with him and he would make them fishers of men. So they pulled their boats up on shore, left everything and followed him. In the same manner, God has called Vida Abundante Church to minister to the Colonia Emiliano Zapata. The church is now casting nets to fund the remaining balance to complete the purchase by December 2014. Donations received will help reduce or eliminate the need for a loan. You Can Help . . . Click here for How to Make a Donation. Be sure to mark donations Cozumel Vida Abundante Land. 1. Give a one-time donation toward the land purchase by December 15 to reduce the need for loans. 2. Provide a monthly or quarterly commitment to the land purchase that will help supplement loan payments beginning January 15, 2015. If loans are not needed, contributions will be used to improve the property. 3. If you have visited Vida Abundante, share photos and your experience with organizations or your church. Sponsor a special activity or offering to benefit Vida Abundante. Example: “Coins for Cozumel” asking people to give coins in their purse or pocket as a special offering. This is a great mission activity for those who may not be able to travel. 4. Visitors and residents can volunteer time, talents and in-kind resources to improve the property by contacting www.friendsofcozumel.com For example, recent mission volunteers donated their labor and/or purchased needed supplies for electrical, plumbing, painting, clean-up and general projects. Help the church with local fundraisers (i.e. face painting, selling crafts or food). 5. The pastors invite you to join them in prayer for the congregation as they focus on developing this spiritual refuge to serve the community. 6. Help us make connections by sharing this information with others who may be interested in supporting Vida Abundante church.